Welcome to our new Colemanite page! Welcome to our Colemanite minerals page! Colemanite, is a complex mineral, that is found in playa lakes and other evaporite deposits. The basic structure of colemanite contains endless chains of interlocking BO2(OH) triangles and BO3(OH) tetrahedrons with the calciums, water molecules and extra hydroxides interspersed between the chains. Colemanite is a secondary mineral, meaning that it occurs after the original deposition of other minerals. The mineral borax is directly deposited in arid regions from the evaporation of water in intermittent lakes called playas. The playas form only in rainy seasons due to runoff from nearby mountain ranges. The runoff is rich in the element boron and is highly concentrated by evaporation in the arid climate. Eventually the concentration is so great that crystals of borax and other boron minerals form. 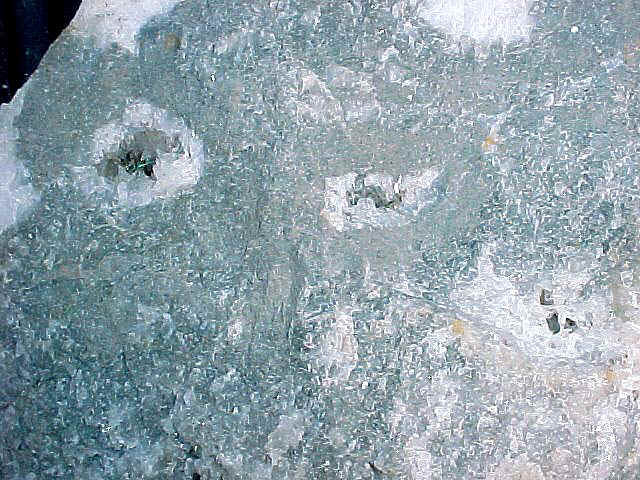 Ground water flowing through the borax sediments at the bottom of the playa is believed to react with the borax and form other minerals such as colemanite. Colemanite is found in geodes within the borax sediment; its exact means of formation are still not well understood. Colemanite forms small but richly faceted crystals. The short prismatic habit is typical and good crystals with complicated faces are sought after by collectors. These specimens shown below are from Boron, Ca. and are from a collection which was handed down to me in 1996 by a dear, late friend, Ed Corbin, of Lancaster, Ca. They were wrapped in newspapers dated 1969 and 1970.